All portlets can be automatically created when Jetspeed first starts up. The default and recommended behaviour is not to create the portlets until they are accessed on a PSML page. Once a page where a portlet exists is requested, then at this point, the portlet is created and added to the portlet cache. # and place them in the cache when Jetspeed starts up. At the time of portlet creation, a portlet's init() method is called. The init method is only called once, during the portlet creation phase. The lifetime of a portlet is controlled by how long a portlet stays in the cache. 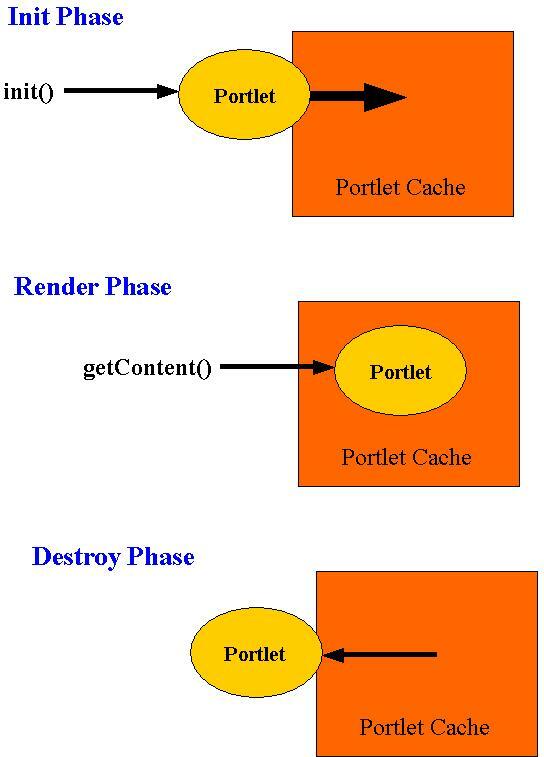 When a portlet is removed from the cache, the portlet is effectively removed from memory (left to the garbage collector) and is no longer accessible. If a portlet is removed from the cache, and then requested again, the portlet will have its init method called again, since a new instance is created of the portlet. Both the system administrator and programmer can control the lifetime of a portlet by controlling how long it lives in the cache. Jetspeed does support another phase in between phase 1 and 2. It is called the processAction phase. Unfortunately, the processAction phase does not manifest itself directly in the portlet interface. Instead, actions must be handled in action classes. Action classes are inherited from Turbine, and they bleed through into the design of Jetspeed, coupling the Jetspeed architecture to Turbine's in a very bad way. Velocity portlets attempt to rectify this design flaw, but the bottom line is that is still a kludge and the action processing phase is not a part of the portlet interface, but must be handled on another action interface. We will cover actions in more depth in the section on Velocity Portlets. During the init phase, it is recommended that you do any one-time initialisation of the portlet. Usually this involves the initialisation of costly resources such as database connections or other costly activities. The render phase is called per request. Every time a portlet's content is requested, the getContent method is called. The destroy phase is dependent on the life time definition of the portlet. Unfortunately, your portlet is never notified when the destroy phase occurs. You can control the life time of your portlet. If your portlet inherits from AbstractPortlet, then the lifetime of your portlet is controlled by how long it lives in the cache, and by how many instances of the portlet there are in the cache. # number of milliseconds an unused portlet will remain in cache. The default setting is 45 minutes. After a portlet has been in the cache for 45 minutes, it will be reloaded. This means the init method is called again. Since there is no destroy method, your portlet doesn't know when it is getting destroyed. If your portlet inherits from AbstractPortlet or AbstractInstancePortlet, then your portlet is cacheable, but it will not be evicted from the cache, since the base implementation AbstractPortlet never allows for your portlet to expire. Some portlets will expire, such as the FileWatchPortlet and NewRSSPortlet which uses the cache to control refreshing of its content. The algorithm takes all of these strings and combines them to make a unique string. Thus the creation of multiple instances of possibly the same portlet is controlled by the uniqueness of the portlets parameters. This seems like a rather odd solution, but works perfectly fine if all of your portlets are RSS feeds, as Jetspeed was once designed but has since evolved into much more. In the example below of an RSS portlet, the key would be combined to create: http://www.mozilla.org/news.rdf|itemdisplayed-10. This isn't really very useful, since the items displayed shouldn't have any affect on the number of instances created of a portlet. Basing the cache on the URL makes a little more sense, since we control the number of portlets to be equal to the number of feeds in the system. New portlets are created for every portlet instance. A portlet instance is defined as each instance of a portlet referenced in a PSML file. Thus for each portlet defined on a PSML page, a new Java instance of the portlet is created and put in the cache with a unique handle of: PSML-PAGE-ID + PORTLET-ID. The important gain with this approach is that you can now have the same portlet twice on the page, and those two portlets will have their own private parameters.